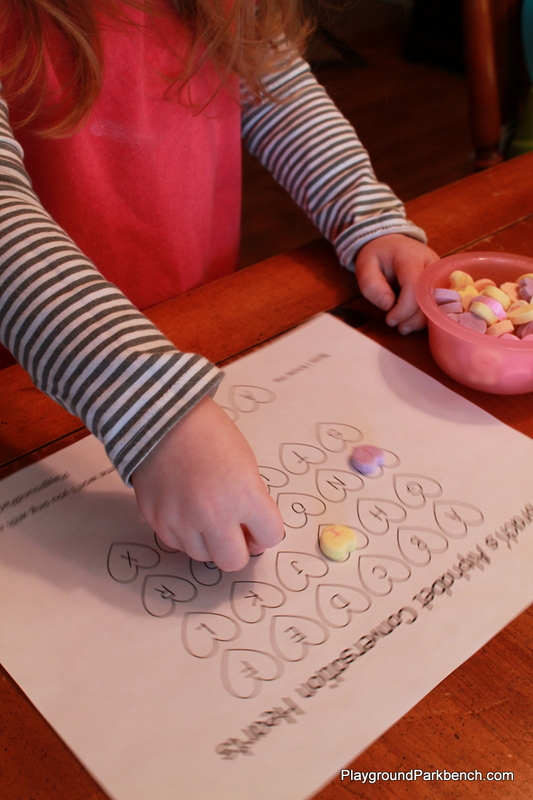 How many conversation hearts did your child get in their Valentine box this week? 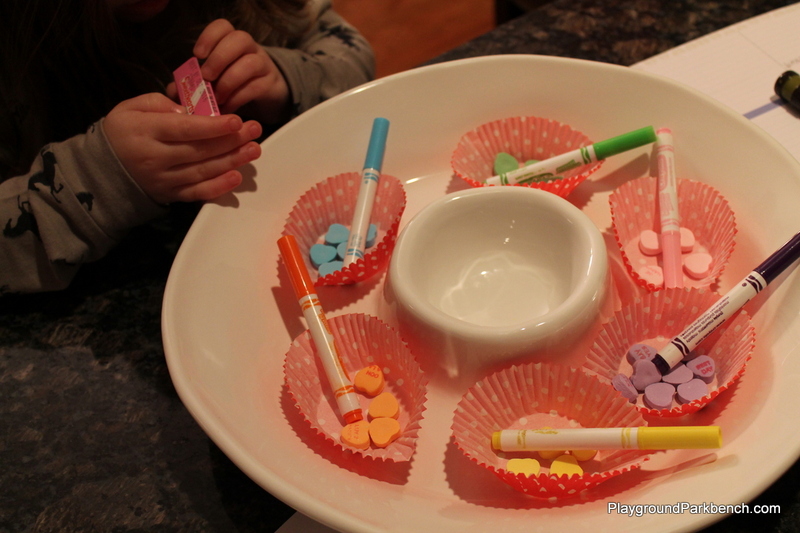 Instead of consuming all those little sugar bombs, you can make a great learning experience with them. 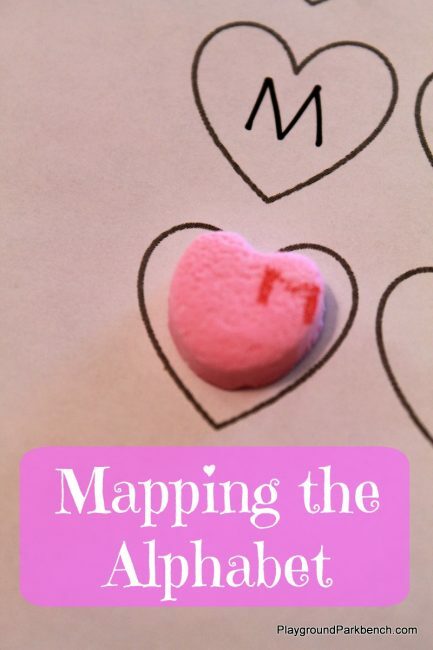 Big M has enjoyed two great activities this month using two different types of candy hearts: Graphing with Sweethearts Conversation Hearts and Mapping the Alphabet with Brach’s Alphabet Hearts. The only materials you will need to get from outside your house are the candy hearts themselves. We received boxes of the Sweetheart conversation hearts, and the Brach’s Alphabet Conversation Hearts I found at Target. Wait until tomorrow and you can probably buy them for 50% off! She sorted them 2-3 times, while I created the printable for our graph. You can download the FREE printable graph from our store below. 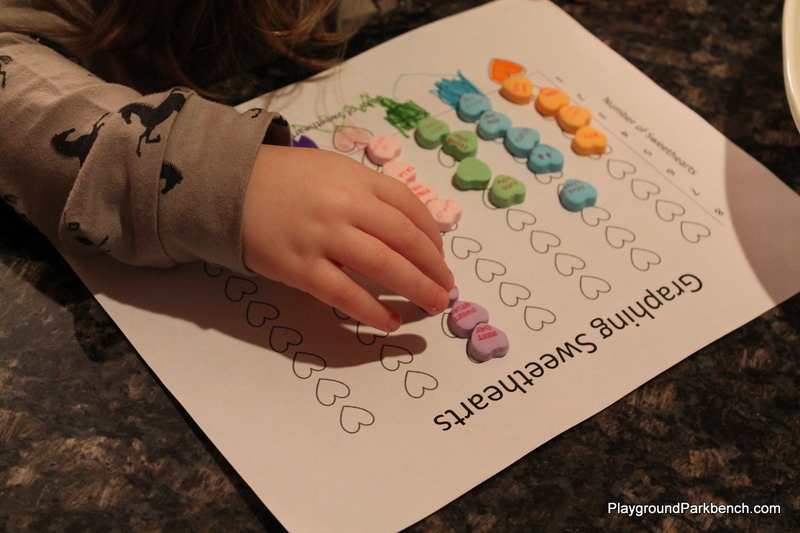 With all the hearts sorted by color, I then gave her our graphing printable and the bag of our favorite coloring media: Crayola Pipsqueak Markers. They are the perfect size for little hands, and because they are small, reinforce proper pencil grip as well. 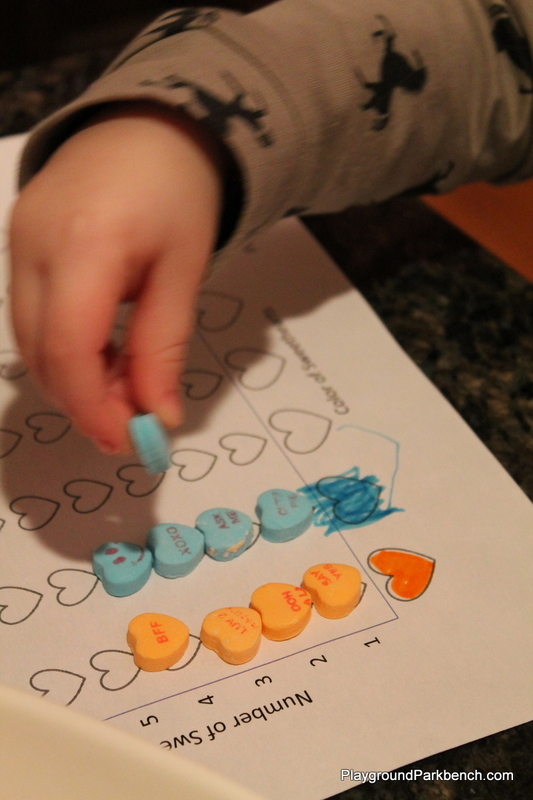 I asked her to pick a marker to match each set of colored hearts. 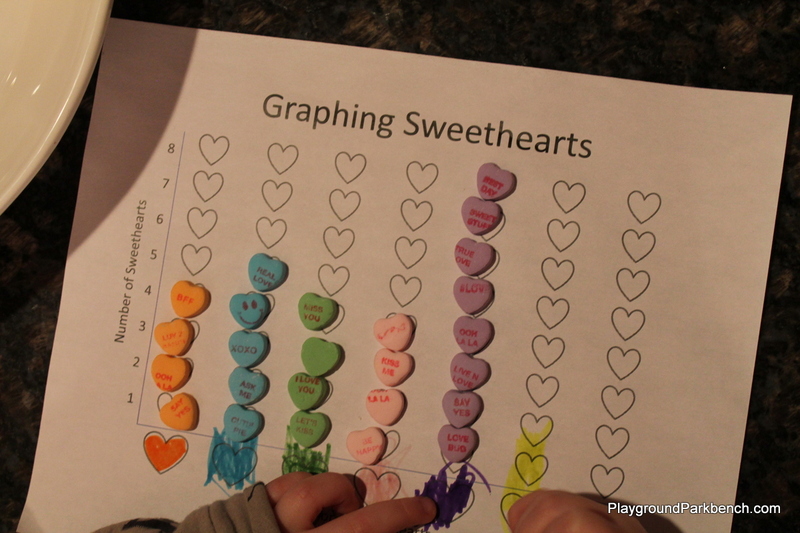 Then, I showed her how we were going to graph the hearts. This was her first graph, and for 3 years old, I thought she caught on beautifully. I demonstrated with the first color, then handed it over and she did all the rest! 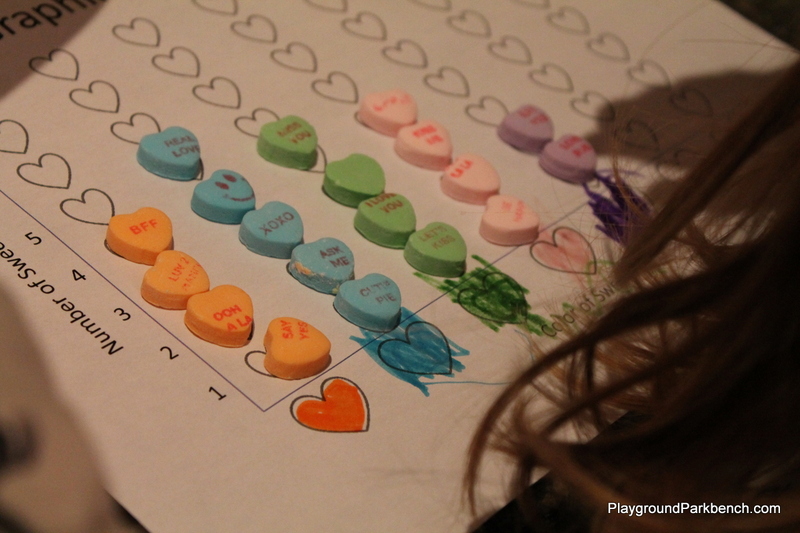 When she completed the graph, we talked about which color had the MOST hearts, and which color had the LEAST hearts… this was tougher since there were four different colors with the same number of hearts. With older children, you could even get into discussion of mode (the number recurring the most), median and average. 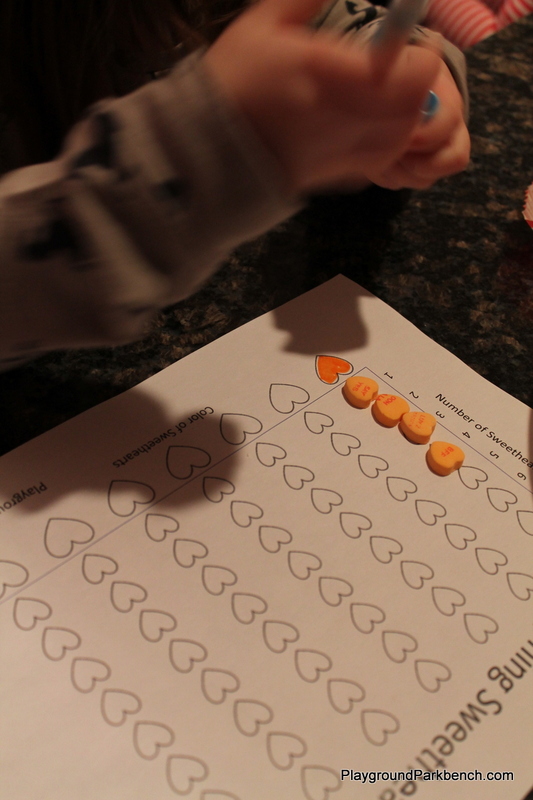 As a self-professed math nerd, I was thrilled with our first little foray into statistics, and she thought ‘the heart game’ was great fun! 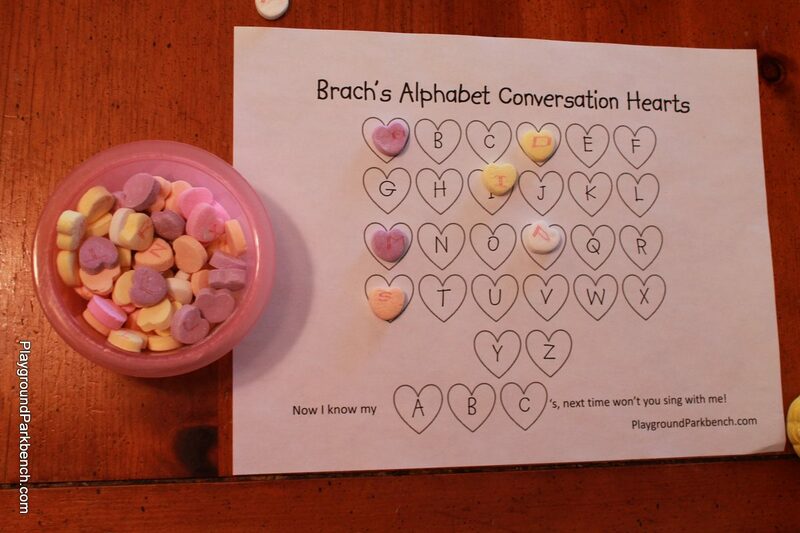 Our second candy heart activity explored letters using Brach’s Alphabet Conversation Hearts. 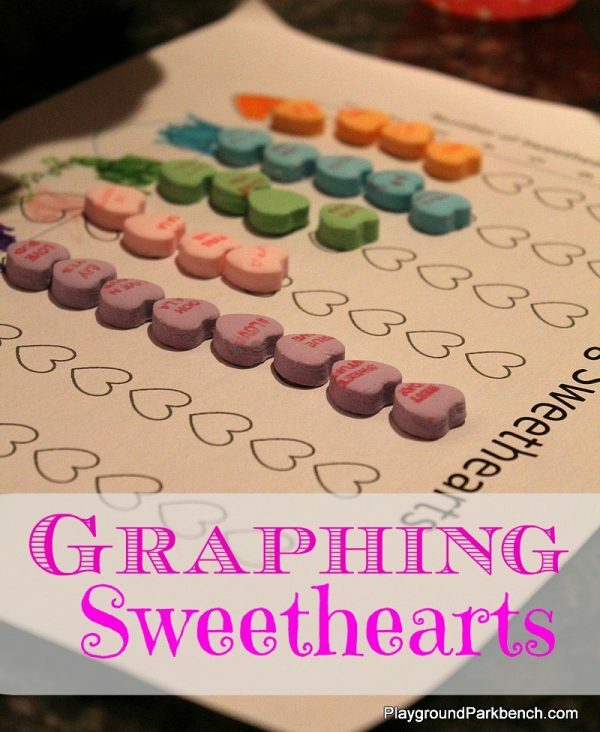 All you need for this one is the Alphabet hearts and our printable. 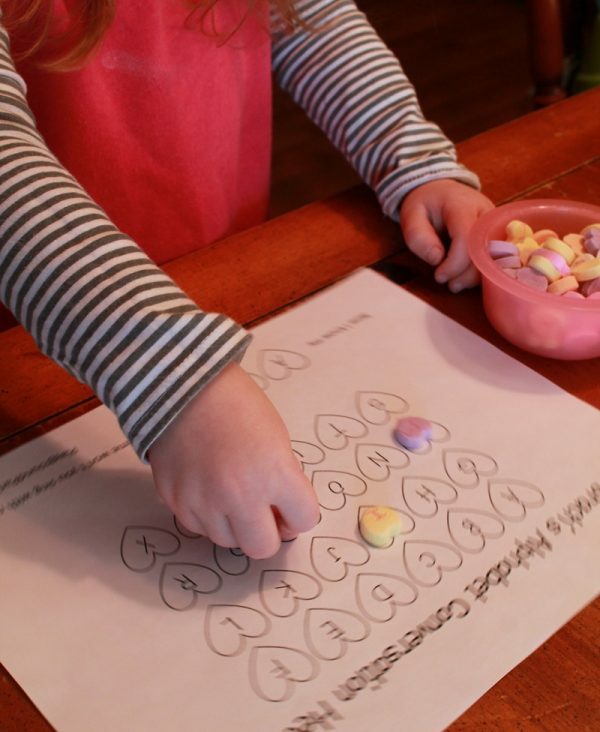 The first page lays out the alphabet, and your child can sort through the bowl of hearts to find all the letters in the alphabet. 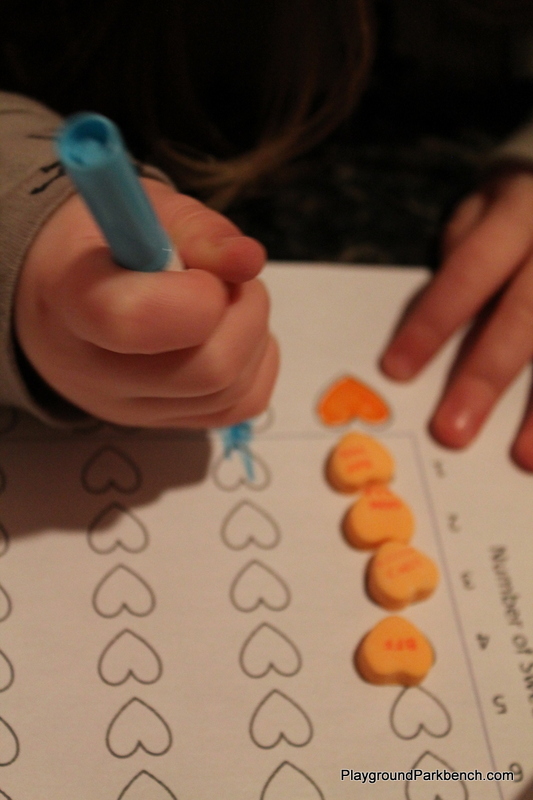 The second page includes blank hearts, lined up in varying lengths where you can create site words for your child to spell out, or, in our case, Big M practiced making her name! This one was a little tougher than the first, and required more assistance – she got frustrated when she couldn’t readily find the letter, and some were much more prevalent than others. But she still had fun – she definitely enjoyed spelling out her name. 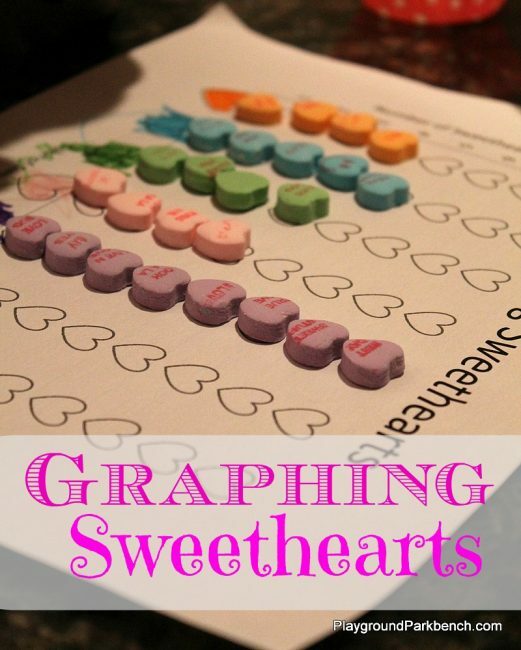 You can download your FREE printable Conversation Hearts Alphabet Map from our store below. 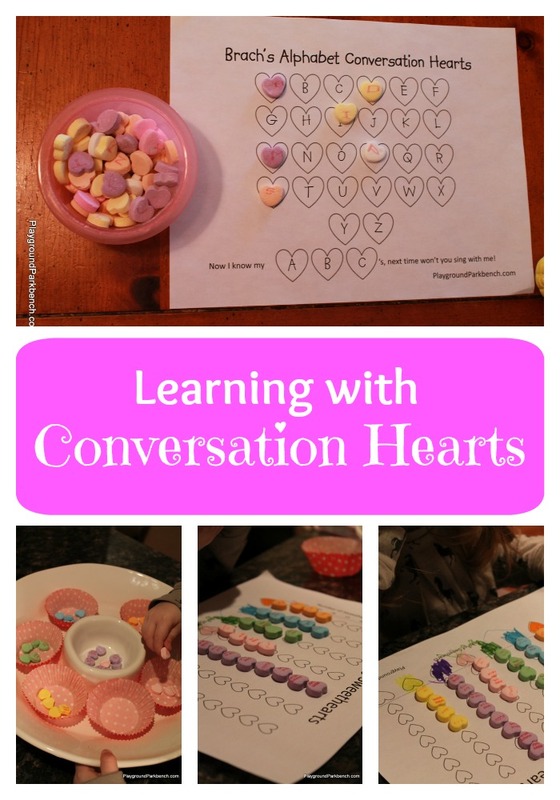 Have you done any great activities with Conversation Hearts? If you enjoyed these activities, you might also enjoy Science Experiments with Candy and Decision Making with Dr. Seuss. 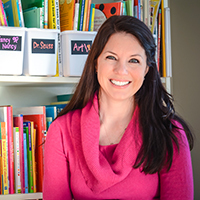 You can find all of these posts, along with our favorite learning activities from around the web on our Decision Making with Dr. Seuss on Pinterest! 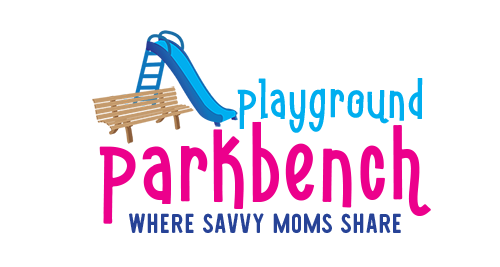 Hi Michelle, my printables are only made available to newsletter subscribers via a password protected page. 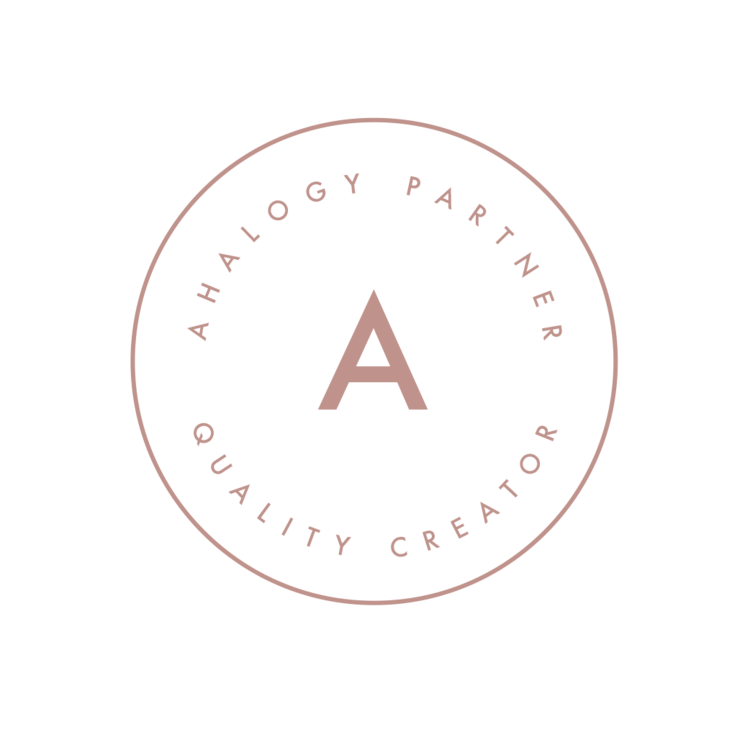 When you confirm your subscription, you will receive a confirmation email with a link to the printables page and the password. Hope that helps! Thanks! Will have to check out your Shamrock Art too!